The battle to represent Kampala city at the World Bank forum in Malaysia is escalating with the Lord Mayor’s office accusing Emmanuel Serunjogi, the Kawempe division mayor, and Nakawa division mayor Ronald Balimwezo of working for his down fall. The organizers bought a first class air ticket for Lukwago to attend the ninth session of the World Urban Forum in Kuala Lumpur, Malaysia. His invitation came through the Foreign Affairs ministry. KCCA was supposed to pay $1,800 for his accommodation and per diem. But Kamya blocked his trip by writing to the city executive director Musisi, saying Lukwago will not travel, without giving the reasons, according to the letter dated January 6. “The man has endless trips and wants high per diem. KCCA, currently is facing financial crisis. We have tried to explain to him but he refused to listen to us,” a source revealed. 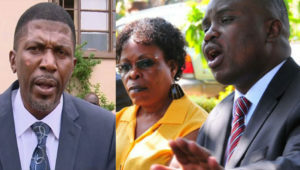 Though Lukwago was blocked, Musisi and Robert Kyuku, the KCCA director of strategy are already in Malaysia, according to a statement posted on KCCA website. Musisi made a presentation on land and municipal finance at the same conference. Kamya, however, cleared Sserunjogi to represent the Lord Mayor. This has caused a war between the supporters of Lukwago and Serujongi. Some officers from the Lord Mayor’s office have been attacking Serujongi, a long time senior DP member like Lukwago. They accuse him of working behind Lukwago to get favours from Kamya and President Yoweri Museveni. Serunjogi in a WhatsApp message seen by PML Daily said it is Lukwago attacking him not his employees or supporters. “I didn’t know that division mayors are not allowed to travel without him,” he said. Serunjogi explained that he was invited to travel to Malaysia to present a paper about propects of New Urban Agenda in June 2017. “I have travelled widely and I am internationally connected. I was invited on June 6, 2017 by Ms Maimunah Mohd Sharif, the executive director of United Nations Habitat, who is one of the organizers of the 9th World Urban Forum. And this is not the first time for me to present a paper in this forum,” Serunjogi told them. He added that he was requested to forward his CV to UN as a speaker. And he was listed as one of the presenters in the forum on merit not as a substitute. “I received my official invitation on 2nd November 2017. In my invitation letter, it was clearly specified that United Nations will cater for my travel, air ticket and accommodation,” he added. For Balimwezo, he was cleared to travel to Mali. Balimwezo told PML Daily that they fell out with Lukwago because he refused to include their inputs into the KCCA budget frame work. The development comes at a time when Lukwago and the division mayors are in sharp disagreement over decentralizing powers from the City Hall to divisions. Currently, Parliament is handling the amendments in KCCA Act. The division mayors are lobbying MPs to endorse the decentralisation so that each division owns its accounts. Lukwago, however, said Kamya is using the mayors to endorse unpopular new amendment bill, which among others, seeks to reduce the powers of the Lord Mayor to the level of a ceremonial figure.